Shropshire employees on maternity leave are not immune from redundancy cuts - that's the message from John Mehtam, our Employment Law Specialist. John said many companies were facing tough decisions in difficult economic times, and redundancies were occurring in all kinds of industries. “If one of your employees has just gone off on maternity leave, which means she could be away for up to 12 months without making any contribution to your business – wouldn’t she be an ideal candidate for redundancy? It’s not the easy option that it may initially seem, but it’s not impossible. “Women on maternity leave do have a special level of protection, so before taking the redundancy route, you must assess whether there is any ‘suitable alternative work’ available elsewhere in your company,” said John. Our business protection scheme, which is the first of its kind in the UK, has beaten all targets in its first two years. The Alpha project has just reached its second anniversary, with interest still increasing on a daily basis. It's a comprehensive 24-hour business support package with particular emphasis on employment and Human Resources support – the scheme also provides insurance protection against claims. The all-in-one package offers face-to-face legal advice and assistance with HR policies and practices, and legal expenses insurance against fees, costs and tribunal awards. Companies also receive legal representation at any employment tribunal, legal updates, training workshops, and direct access to the entire Martin-Kaye Commercial Department, not just the employment team. 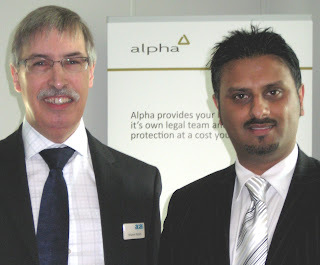 Alpha includes discounted legal services for each member business and their employees too – no matter which department they need help from – including conveyancing, wills, divorce and other personal issues. Shropshire companies are responsible for the safety of all staff who drive on business – whether they’re using a company vehicle or not. Graham Davies, our Senior Partner, said employers must take steps to ensure their staff were not at risk. He warned that setting out safety rules in the staff handbook was not enough – companies will have to demonstrate they are enforcing the policies and be able to produce appropriate evidence. “Make sure your staff have the right insurance to use their own cars for business – this needs a simple amendment to their existing private insurance.You’ll also need to make sure that any car used for business is properly maintained – so take copies of MOTs and service histories, and keep a file for every vehicle as though it was a company car. Divorcing couples need to be “more realistic” when it comes to negotiating their finances - that's the message from Nadia Davis, who leads our Family Team. Nadia said if court proceedings were the only suitable option, couples should set their sights at a realistic level. “Don’t assume you will be able to secure the kind of settlement that we have seen previously in the more high profile divorce cases, particularly those involving footballers and celebrities. Elderly Shropshire homeowners who face the prospect of selling up to pay for their care must consider all the options. A strict means test system rules that anyone with savings or property worth more than £22,250 has to fund their own care payments. “This means that anyone who owns their own house or flat is obviously going to be over the financial limit, and local authorities have legal powers to make people in care homes sell their houses to meet the costs. Andrew said it was vital that families did not make rash decisions, and that they considered all the options available to them. “It may not be necessary in every case to sell the family home, particularly if you take legal advice early enough – you may be able to set up a family Trust, which can be tailor made to suit your family’s individual circumstances. Over 100 business people from across Shropshire heard about radical new changes to grievance and disciplinary rules from a leading UK expert. We organised the seminar at our offices at The Foundry, in Euston Way, Telford, with a guest presentation from Howard Paskin – a senior adviser at ACAS. John Mehtam, our Employment Law Specialist, said the new rules on discipline, grievances and dismissals were due to come into force on April 6. “We wanted to make sure local employers had the opportunity to find out exactly how the changes would affect their business, and we were overwhelmed with interested companies. The event was a real coup for businesses in Telford and Shropshire as it was one of Howard’s few local presentations, and it was clear that employers were keen to find out everything they could in advance of the deadline. Any businesses who missed the seminar should contact our Employment Law Team on 0845 644 6376 or email alpha@martinkaye.co.uk for advice.